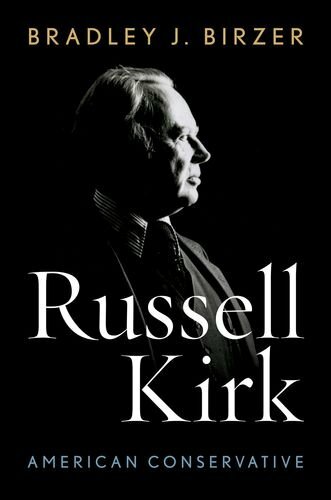 Kirk's 1953 landmark book The Conservative Mind from Burke to Santayana, drawn from his doctoral thesis, basically invented a tradition of Anglo-American thought and established him as the standard-bearer of what is now typically called traditionalist conservatism. Over the next four decades, through some two dozen books and a long-running column in National Review and elsewhere, Kirk defended a conservatism of limits, respect for tradition, and the need to preserve our fragile social order. At the same time, though, he was a self-described "Bohemian Tory" who had spent some years of his young adulthood tramping around Scotland and North Africa and making acquaintance with writers such as Robert Graves, various Scottish lairds, and, most important, T. S. Eliot, who brought out The Conservative Mind in the United Kingdom. Significantly, too, Kirk was an accomplished writer of ghost stories. Birzer rightly notes that "in some ways, his fiction offers the best window into his mind and soul." For Kirk, temporal reality was at times only a thin film over the eternal, and his fiction explored those boundaries in a way his non-fiction could not. Kirk spent his life seeking out authors whose work could make (as he phrased it) time and timelessness intersect, from Flannery O'Connor to Ray Bradbury. This mystical side was not a pose, or an otherwise unexplainable addendum to a dry writer of learned articles. It was central to Kirk's view of reality, in which the imagination played a crucial role. In a passage Birzer quotes, Kirk writes that "The image, I repeat, can raise us on high[;] … also it can draw us down into the abyss." Whether a society presents images that lead us higher or lower is the central question that conservatives must address. Thus Kirk's writings can seem exasperating to scholars; they are discursive, often quasi-autobiographical, compressing much material along the lines of a great tale rather than a series of deductive propositions. That style was deliberate. Kirk was creating a series of images, a narrative for the West to set against what he believed was the desiccated and doomed narrative of liberalism. Birzer homes in on this very point, which is critical to understanding what Kirk was trying to accomplish: "Liberalism in its modern forms—whether what one might call eighteenth century classical liberalism or twentieth century progressive liberalism—had never created anything… . [L]iberalism had become nothing but a whirligig of confusion, Kirk believed." Moreover, because it had no stable defining principle, liberalism could not compel the imagination as a conservatism of tradition could. For if the defining principle of liberalism was liberation, what end did it serve but the individual will? If equality, where could that end but tyranny? Kirk believed that liberalism provided no coherent or compelling image. And indeed, seeing contemporary liberalism devolve, especially in the universities, to little more than the will to power and the assertion of an ever-changing "I" whose transient desires demand that the world moved to accommodate them, Kirk seems prescient. But alas, as Birzer argues, conservatism too has lost its imaginative power. Since his death in 1994, Kirk has remained a respected but lesser-known figure in the conservative firmament. In part this is simply to be expected with the passage of time, but his relative neglect also speaks to the current state of conservative thought. Since September 9/11, conservative élites have promoted policies—including unrestricted immigration, free market ideology, and apparently unrestricted foreign intervention—that are deeply at odds with the localist conservatism of Kirk. Conservatism now speaks much of the same language as liberalism, and the evocative narrative Kirk tried to summon that links the generations has been all but lost. Kirk opposed most foreign intervention, initially from his experience in World War II, but also because he saw the dehumanizing effects of modern war on victim and victor alike. Nor was he an admirer of the unfettered free market if that market simply solemnizes a materialist philosophy closed to the transcendent. Birzer examines this through Kirk's use of the word boredom, a spiritual malaise that afflicts even (perhaps especially) affluent societies when they turn from religion, tradition, and social order. Imagination rules the word, Kirk liked to say; if there is little imagination at work in conservatism currently, its cultural influence will be low. And, since politics follows culture for Kirk, its political influence will fade as well, or become grotesquerie.